You know “family packages” are usually for a family of four? At a Salt Lake City Bee’s game you can win a family pack of baseball tickets – for a family of eight. In the Bee’s program, along with the lineup and scorecard, are advertisements for local Mormon churches. The parking lot (where you should NOT park, to avoid the $6 fee) is filled with large and expensive looking SUV’s – useful for both traversing mountain passes and shuttling large families to and fro. This is one reason why I always buy tickets to minor league baseball games when on a spring or summer road trip. (The other reason being that I love baseball more than traveling itself. And that’s saying a lot!) Minor league ballparks provide major community insight. The outfield walls will be covered with advertisements to local restaurants. Community events will be referenced over the loudspeakers in between innings. Friendly people surrounding you (because baseball lovers are the best kind of people) will fill you in on anything you might want to know about their hometown. From the ceremonial first pitch to the 7th inning stretch, minor league stadiums are “1-2-3” times better then local tourism offices. Peruse the concession area and enter any contests. Almost all stadiums have free giveaways. Since this is not a major-league crowd, you actually have a good chance of winning! Ballparks are often in questionable areas of town (where land and property is cheaper), so be aware. Surrounding hotels are often not the best…but usually they are less expensive. Minor league players are amenable to signing balls and programs. Come early or stick around after the game to score an autograph. Check www.milb.com for a list of ballparks throughout the US. Call ahead to reserve tickets because some stadiums do sell out. Bring blankets and warm clothes. Even Southern California gets cold in the 8th inning. Learn how to keep score. It’s fun, a great conversation starter, and a good record of the game. If one of the players makes it to the majors it’ll be fun to look back and remember the game where you saw him as a 19-year-old rookie, chasing big dreams. In preparation of my upcoming move to Seattle I was bringing a carload of stuff to the cheapest storage place I know: Mom and Dad’s house. My plan was a quick and cheap road trip: Leave Las Vegas Friday afternoon, be in Seattle by Sunday. Maybe even Saturday night. The stupidity of such a plan was apparent as soon as it got dark. The problem wasn’t road visibility, it was mountain visibility. Peering out my car window I could barely make out snow capped peaks in the moonlight. I saw just enough to realize that I was missing great scenery. It was killing me. I stopped for the night outside of Salt Lake City, and awoke to blue skies and those mountains. Completely blanketed in snow. Not exactly an avid skier, I hadn’t even pondered the possibility of lifts being open this late in April. But there was no way I could keep driving on. I pulled into a Starbucks to look up Utah ski information on their free WiFi. Taking my obligatory latte order was a cute but scruffy looking guy with a sunburned face, save for the white goggle shapes around his eyes. Ah-ha. No Internet would be necessary. Cute skier-Starbucks guy assured me that roads were clear, lifts were open, and pointed me up highway 209. 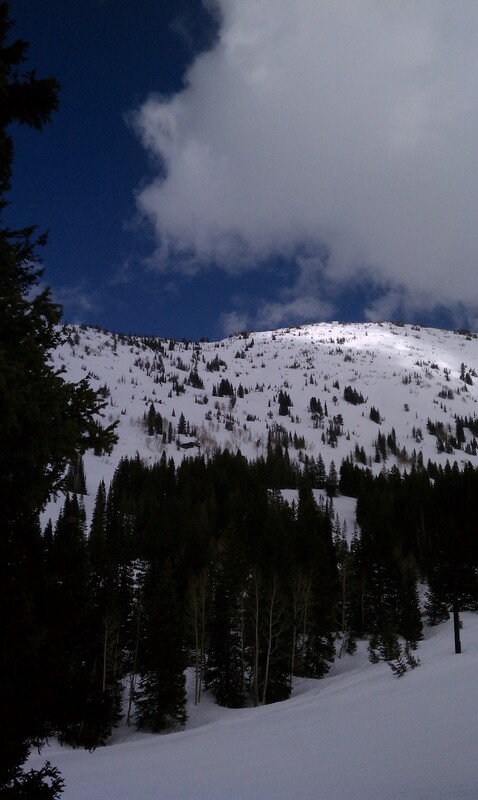 Less than an hour later I was at Alta ski resort unloading kitchenware out of my trunk to get to the ski pants I had packed in the back. My goggles and gloves were still in Vegas though. I explained my predicament to the gals at the ski shop who let me borrow some goggles for the day. They suggested I search the “lost and not found” bin for gloves. Jackpot. Obviously I had to rent skies, boots, and poles, but for a reasonable $22.